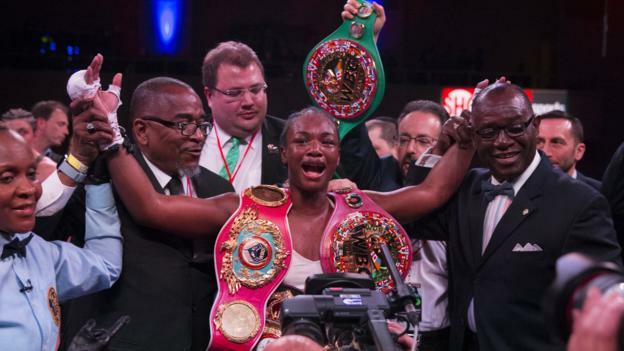 American Claressa Shields maintained her unbeaten record and unified the women’s middleweight division with a unanimous decision win over Christina Hammer on Saturday. Her WBA, WBC and IBF belts and Hammer’s WBO belt were up for grabs in the bout. “I am the greatest woman of all time, give me that,” Shields, whose record moves to 9-0, said after the fight. “You all told me I couldn’t do it,” said Shields, who won Olympic middleweight gold at London 2012 and Rio 2016. “Women’s boxing is on fire. I cannot wait to see the next super fight, whoever is in between. “Respect to Claressa Shields for becoming the Undisputed Champion tonight. Tonight was not my night but I will be back,” Hammer wrote on Twitter after the fight. Oscar-winning actress Halle Berry tweeted her support for Shields, dubbing her a “star of the sport”.